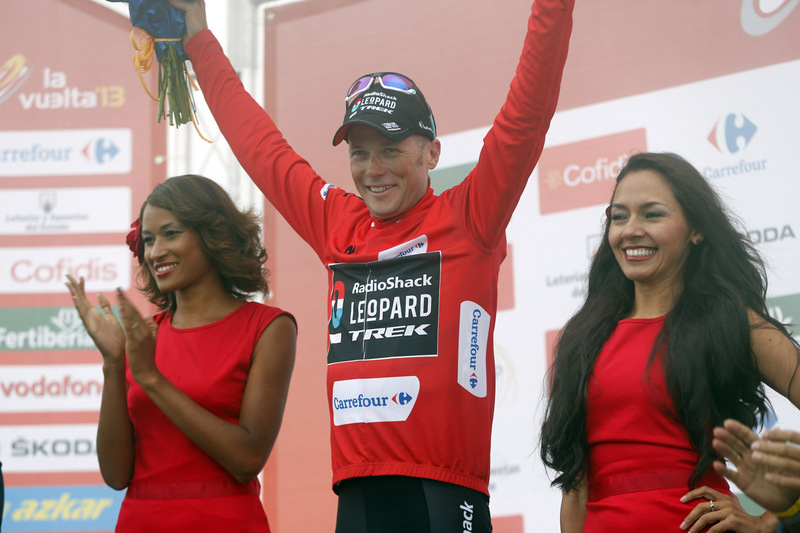 Chris Horner (RadioShack) defended his red jersey in a thrilling finale to the Vuelta a Espana, despite the brave efforts of his rival Vincenzo Nibali (Astana) on the brutal Angliru climb. Further up the mountain, youngster Kenny Elissonde (FDJ) reached the summit first to take the stage win following an exceptional ride, but even more compelling was the battle for the overall. It has been a trend in recent years for organisers of grand tours to schedule the biggest mountain of the race on the penultimate day, in the hope that it will provide a gripping final showdown. And while in most cases this has failed to come into fruition as races were more or less settled before the final weekend, the duel between Horner and Nibali on the Angliru is exactly what these organisers have had in mind. Horner and Nibali went into the stage with just three seconds separating them, and this slender lead swung back and forth as the pair battled it out on the exceptionally steep slopes of the final climb. The Italian made several attacks in the final kilometres, and was at times able to distance Horner by a few seconds; but the American remained resolute and each time inched back onto his wheel, before unleashing his own acceleration close to the top of the climb, and distancing Nibali for good. The drama and tension were enhanced by the atmospheric conditions at the higher slopes of the climb, which were oppressed by the mist, as well as by the difficulty the television motorbikes endured trying to stay with the riders as the roads narrowed and the crowds increased. Astana had seemed to have planned a Nibali attack by placing climbing domestiques Paolo Tiralongo and Jacob Fuglsang in the break, but they appeared to mistime their efforts. When Nibali made his first move six kilometres from the summit, Tiralongo was riding alongside Elissonde at the front of the race (having dropped the rest of the break), while Fuglsang was nowhere to be seen. By the time both had dropped back, Horner had bridged back up to the Italian, while all the Astana pair could do was pace for a few minutes before having to peel off exhausted. 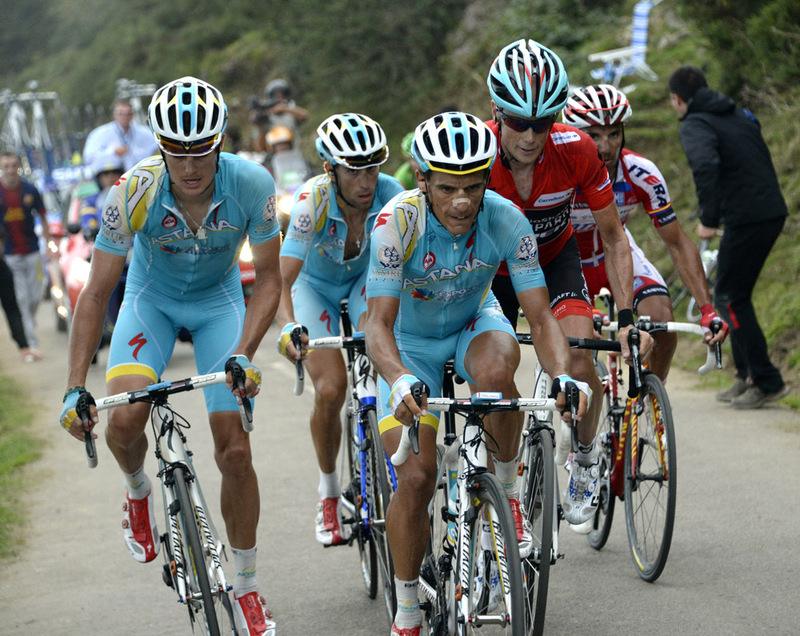 Nibali may berate the absence of his teammates’ help when he had distanced Horner by almost ten seconds. Tiralongo’s instruction to wait for his leader also benefited Elissonde, who was able to ride alone to the finish to claim victory. The 22-year old in the process claimed France’s fourth stage win of the Vuelta, which, remarkably, is more than the home nation has managed. Given the struggle the French often have in achieving success in the Tour de France, and given that each of their winners here are 25 years old or younger, the future looks bright once more for the once great cycling nation. While Elissonde rode to victory, and Nibali and Horner battled for the red jersey, further down the mountain Alejandro Valverde (Movistar) sealed his third place ahead of Joaquim Rodriguez (Katusha). Valverde had looked weaker to begin with, and had been dropped before Rodriguez, but managed to pace himself sensibly and even overtook Nibali by the finish line, to finish third behind Elissonde and Horner, 58 seconds ahead of Rodriguez. There was little change in the rest of the top 10 as Nicolas Roche (Saxo-Tinkoff), despite losing time on some of his closest rivals, held on the fifth place. The only movement was Leopold Konig (Netapp) who slipped from seventh to ninth, at the expense of Thibaut Pinot (FDJ) and Samuel Sanchez (Euskaltel). Meanwhile Nicholas Edet collected enough points on the smaller mountains of the stage to hold onto his lead in the king of the mountains competition.